In the face of such hard grief, what do we have to offer? Few tragedies wound with as much trauma and inflict such deep sorrow as the death of a child. Certainly every death of someone close to us can rattle us down to our marrow. However, something about the death of a child dismantles the strength and challenges the faith of even the strongest of Jesus' followers. I still hear the wailing sorrow of a dear friend being told her son had died. I watched this past Sunday as a sweet friend held an aged mother as she shook with grief after losing her adult son unexpectedly. I have felt the bitter chill of a nasty, wet, early spring north wind as it gouged empty canyons into the grief-stricken hearts of a young couple as they buried their baby boy. Losing a child is unspeakably hard. Such a death mocks us in its unfairness of parents having to bury children. Everything in us cries that children should bury parents. Near the cross of Jesus stood his mother, his mother's sister, Mary the wife of Clopas, and Mary Magdalene. When Jesus saw his mother there, and the disciple whom he loved standing nearby, he said to her, "Woman, here is your son," and to the disciple, "Here is your mother." From that time on, this disciple took her into his home (John 19:25-27). These words are poignant and touching. They reach across the centuries and put a human face on the tragic and brutal nature of the cross. I am reminded that the crucifixion is more than a story about an obedient and divine Son submitting to the will of the Almighty God, his Father. The cross is also a story of a mother and her beloved son. Mary's boy was savagely beaten, repeatedly mocked, openly ridiculed, and physically tortured and humiliated till he died. Through Mary's eyes, a little of God's pain becomes real. We can imagine the pain of a mother losing her son. God's grief becomes a little more comprehensible to us through the agony of Mary. When he arrived at the house of Jairus, he did not let anyone go in with him except Peter, John and James, and the child's father and mother. Meanwhile, all the people were wailing and mourning for her. "Stop wailing," Jesus said. "She is not dead but asleep." They laughed at him, knowing that she was dead. But he took her by the hand and said, "My child, get up!" Her spirit returned, and at once she stood up. Then Jesus told them to give her something to eat. Her parents were astonished, but he ordered them not to tell anyone what had happened (Luke 8:49-56). I love the phrase, "My child, get up!" I am reminded of a good deaf friend who has gone to meet the Lord and his excited confidence when he said, "The first voice I will hear will be Jesus' voice, and the first words I hear will be Jesus' saying, 'Lloyd, it's time to get up and come home with me!'" Jesus went with his disciples to the village of Nain, and a large crowd followed him. A funeral procession was coming out as he approached the village gate. The young man who had died was a widow's only son, and a large crowd from the village was with her. When the Lord saw her, his heart overflowed with compassion. "Don't cry!" he said. Then he walked over to the coffin and touched it, and the bearers stopped. "Young man," he said, "I tell you, get up." Then the dead boy sat up and began to talk! And Jesus gave him back to his mother (Luke 7:11-15 NLT). What a precious way to describe such a life-changing moment: Jesus gave him back to his mother. Oh, how every parent who has lost a child to death could experience such sweet grace! Most of our earth-bound explanations run up against death's realities and come off shallow and trite. I don't have the right words or any simple answers for parents who bury children. I hope I am like the dear Christian brother who looked into the aged mother's eyes Sunday. Then, he lovingly said, "I am sorry. We love you. We hurt with you. Your group of friends will stand by you." Then without trying to explain, hugged her, listened to her some more as she described her shock and pain. Then, held her shoulders and told her gently and tenderly what he has said to reassure her earlier. A moment later, he hugged her again and let her tears fall on his shoulder as her shaking subsided. Very truly I tell you, a time is coming and has now come when the dead will hear the voice of the Son of God and those who hear will live (John 5:25). At that moment, each believing parent receives the blessing of Jesus giving that child back. Only this time, all reunions will be permanent, and all separations banished to a broken world left behind. And I heard a loud voice from the throne saying, "Look! God's dwelling place is now among the people, and he will dwell with them. They will be his people, and God himself will be with them and be their God. 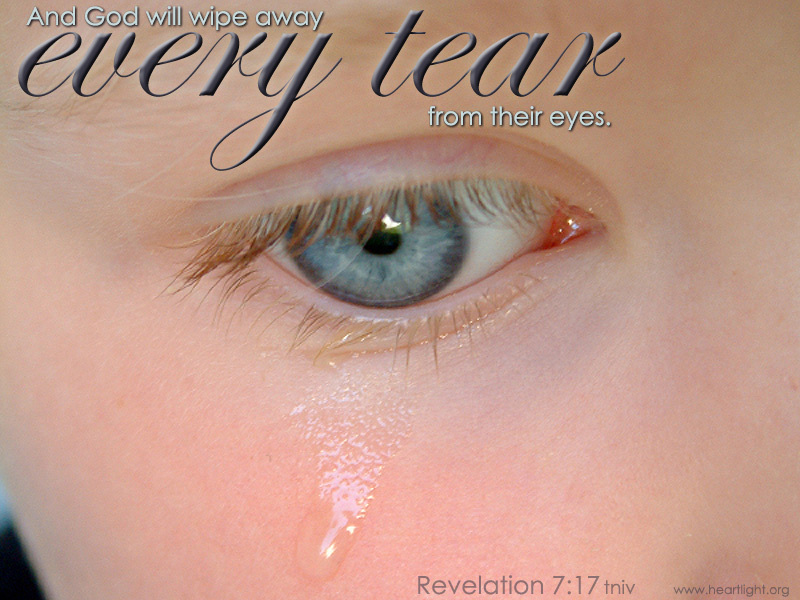 'He will wipe every tear from their eyes. There will be no more death' or mourning or crying or pain, for the old order of things has passed away" (Revelation 21:3-4). Special thanks to The Lumo Project and Free Bible Images for images related to the ministry of Jesus. "'My Child, Get Up!'" by Phil Ware is licensed under a Creative Commons License. Heartlight encourages you to share this material with others in church bulletins, personal emails, and other non-commercial uses. Please see our Usage Guidelines for more information.